Free but YOU ARE TRYING CAT ET 2010 2011 ON YOUR OWN RISK!! For security purposes, Microsoft Internet Explorer version 9 or newer is recommended. Note: The most recent version of Microsoftò Internet Explorer may not be validated to work with the service tool. What is CAT ET 2017A? CAT ET (Caterpillar Electronic Technician) 2017A is an updated version of the dealer level program for the diagnosis of all equipment Caterpillar. 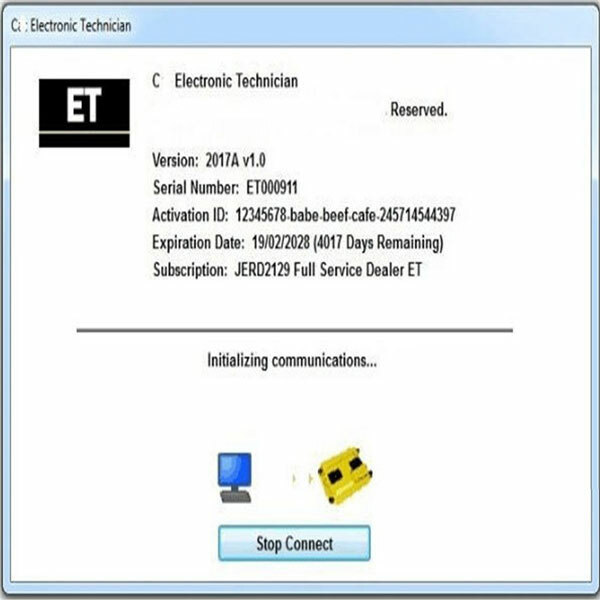 This program works with the dealer diagnostic scanner Caterpillar Communication Adapter, as well as other adapters for diagnostics including scanner Nexiq; the program provides the full information when troubleshooting. 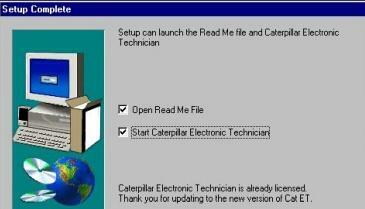 Caterpillar ET diagnostic program for the entire technology Caterplillar. 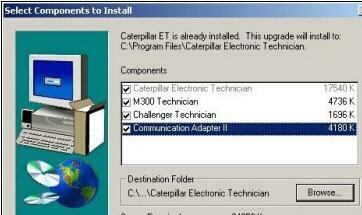 This program works with the dealer diagnostic scanner Caterplillar Communication Adapter. Software Caterpillar ET is necessary for firms involved in the diagnosis of building and special machinery Caterpillar. 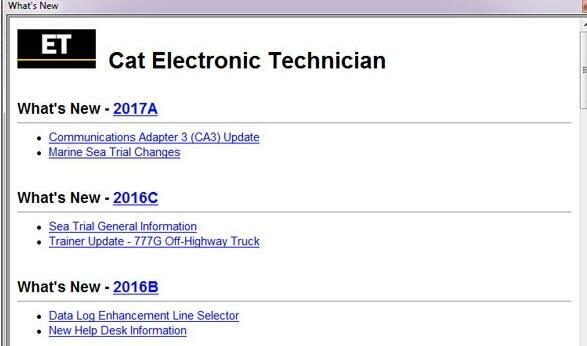 Caterpillar ET allows you to work with the diagnostic adapter and provides complete information for troubleshooting. What’s New – Caterpillar ET 2017A? 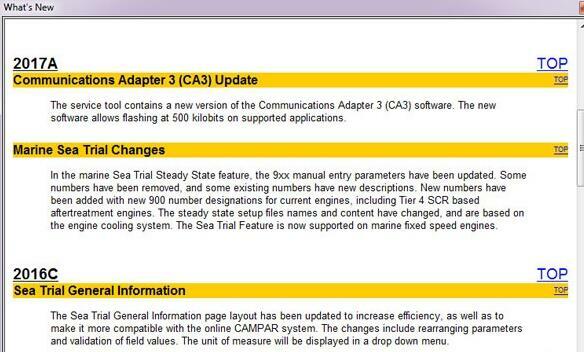 In the marine Sea Trial Steady State feature, the 9xx manual entry parameters have been updated. Some numbers have been removed, and some existing numbers have new descriptions. New figures have been added with new 900 number designations for current engines, including Tier 4 SCR based after treatment engines. The steady-state setup files names and content have changed, and are based on the engine cooling system. The Sea Trial Feature is now supported on marine fixed speed engines. Step 1 Close any applications you are running. 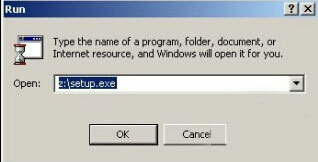 This includes any connections to mainframe computers or networks.Only Windows should be running. 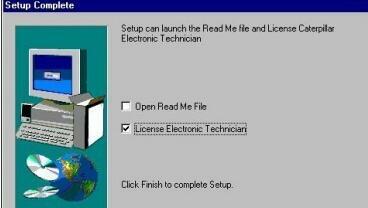 Note: If you are running Windows NT, Windows 2000, or Windows XP, you must have administrative rights on your computer system to install the service tool. 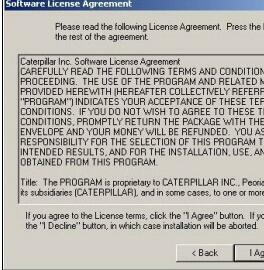 Step 7 Read through the license agreement. Press the “I Agree” pushbutton to accept the terms and conditions. 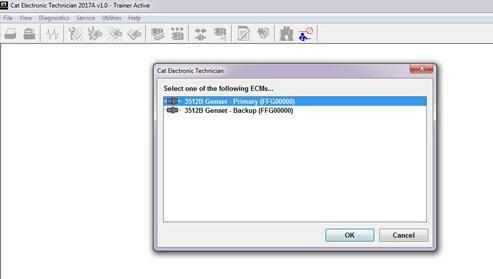 The Select Components dialog box is displayed Press “<Back” to return to the previous screen. Press “I Decline” to abort the setup process. You must have at least Internet Explorer version 5.5 installed on your PC to run the service tool. If you do not have Internet Explorer on your PC, you must install it. If you have an older version of Internet Explorer on your PC, it may not support the service tool, and you need to update your current version of Internet Explorer. Press “Yes” in the Install Internet Explorer dialog box to begin the installation. Note: A message box may display asking you to reboot. 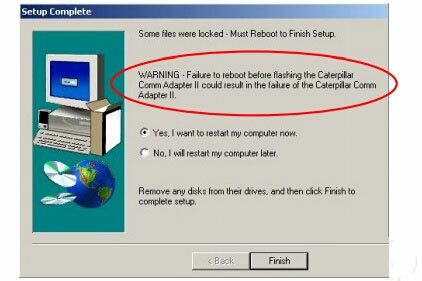 Rebooting is required before continuing installation. Upgrade information: If you are upgrading from a previous version of the service tool, and if your current service tool is licensed, the License dialog box is displayed showing the current license number. Write down the license number and keep it in a safe place. Press “OK.” The Select Components to Install dialog box is displayed. Step 8 Select the check box corresponding to the components(s) you wish to install. To select a path different from the one shown in the Destination Folder area, press the “Browse…” pushbutton. The Choose Folder dialog box will display. In this dialog box, you can change the directory path by selecting the drive and folder that you want to install to by typing the complete path in the Path text box. To check available hard disk drive space for all available drives, press the “Disk Space…” pushbutton. The Available Disk Space dialog box will display. Press “<Back” to return to the previous screen. Press “Cancel” to abort the setup process. 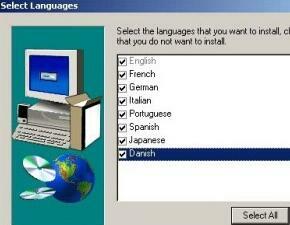 To select all language check boxes, press the “Select All” pushbutton. Pressing the “Clear All” pushbutton clears all checked languages except English, which is always checked. 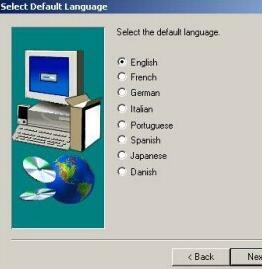 Step 10 Select the radio button corresponding to the default language you want. You can change the language later in the service tool. Press the “Next>” pushbutton to continue the setup. The Select Program Folder dialog box is displayed. 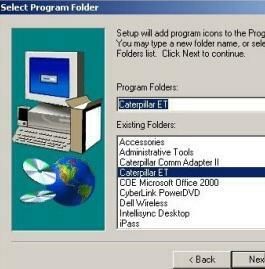 Step 11 CAT Caterpillar ET is the default Program Folder name. If you want to change the Program Folder name, select a folder from the Existing Folders text box, or type a folder name in the Program Folders text box. Note: A dialog box displays the question, “Would you like this installation to put the service tool icon on your desktop?” Press “Yes” to place the icon on your desktop, or press “No” if you do not want the icon placed on your desktop. Once the service tool icon is placed on your desktop, this dialog will not display. When installing the Communication Adapter II, a message box is displayed with important instructions about the Communication Adapter II. Press “OK. 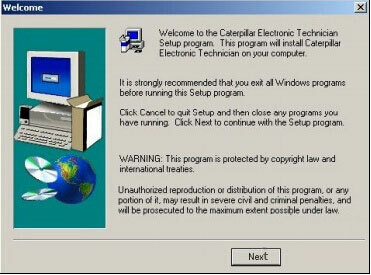 then you must restart your computer to complete the setup. Select the “Yes, I want to restart…” radio button to restart your computer now, or select the “No…” radio button to restart your computer later. Press the “Finish” pushbutton to complete the setup. The “<Back” pushbutton is disabled. Step 7 “COM1” should be selected. This application firmware only supports Serial communications.